Are you a fan of the band named Tool? Here you can find and listen to the best songs by Tool and watch some of their videos. Enter the wonderful world of Tool! Tool is an awesome band and most certainly one of the best band currently existing on our planet! Here you can listen to my selection of the best Tool songs and vote for your favorite song by Tool. Some songs also contain lyrics explanation and their meanings for you to understand them more easily. If you like good music and the best musicians than you will most probably love this band! If you don't know about this band yet this is a great chance for you to discover new great music and to enter the world of this amazing band named Tool! If you know this band already and you're a fan than you will surely enjoy listening to their best songs. It's really hard to make top lists of the bands that are your favorite because all their songs go to these lists. But I narrow my selection to my top 5 Tool songs. Songs that I listen to the most and make my day everyday and every time I hear them. This is not just the music, it's my personal journey to the other dimension and my shelter from this crazy world. I hope you will find something beautiful in their music too! This songs is about us and the time we live in. It talks about our satisfaction and entertainment of watching others suffering and dying while we just stare from a safe distance. It's about people watching news on the TV to satisfy their need of horror and pain that happen to others in real life. We stare like junkies into the TV! Vicariously I, live while the whole world dies You all need it too, don't lie! Wings for Marie and 10,000 Days are two of the best songs from their album 10,000 Days.These two songs are actually one song divided in two parts. They make a story together. They're about Maynard James Keenan's (Tool singer) mother named Judith Marie. Judith Marie was paralyzed when Maynard was 11 and she stayed paralyzed until she died 10,000 days later (you can connect this with the line in the lyrics saying "10,000 days in the fire is long enough; you're going home"). Judith Marie kept faith in God the whole time. The first song "Wings for Marie" is more about Judith Marie dying, and then Maynard accepting her pain and near death. The second song "10,000 Days" is more about Judith's life and beliefs in general, and Maynard accepting them. 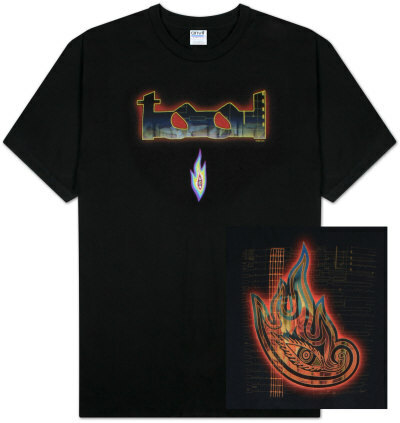 Check out some really awesome and well designed Tool shirts and show the world how much you love the band by wearing them! From Tool comes this awesome Spiro II Standard Cotton T-Shirt in Black with the famous Tool Logo on both the front and back. Great T-Shirt if you're a big Tool fan.